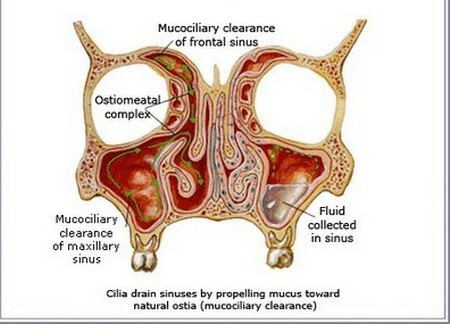 Sinusitis is the inflammation of the mucous membranes of the facial maxillary sinuses, the air-filled cavities around the nose, which causes pain. It usually occurs after an infection that started as a cold or sore throat spreads along the narrow pas­sages from the nose. Occasionally, it can also be caused by an oral infection such as an abscess, or infected water entering the nose after swimming. 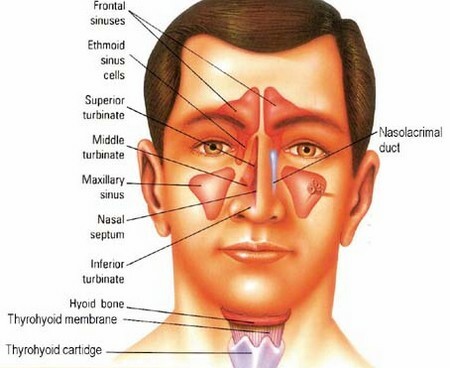 Mucus is unable to drain away and the tension caused by the build-up leads to pain across the face, especially when moving the head. There may also be a fever, yellow-green discharge from the nose or the nose may become blocked, leading to a loss of sense of smell. It occurs more often in older children as babies and younger children still have relatively underdeveloped sinuses. Monitor your child’s sore throat or cold for signs of infection spreading to the sinuses. Also check that nothing has been inserted into the nose that is causing the pain. Keep the child’s room moist and cool as this can help to relieve symptoms -try placing bowls of water by heated radiators, or, if your child suffers recurrent bouts of sinusitis, it may be worth investing in a humidifier. A menthol steam inhalation may also help to get the secretions moving again. An aromatherapist may recommend a blend of oils to use during inhalation. These may include Rosemary, which has analgesic properties, Thyme, which can help fight the bacterial or viral infection, and Tea-Tree to help stimu­late the immune system. Or a blend of Rosemary, Geranium and Eucalyptus may be suggested, and a drop put on a hand­kerchief to inhale. A naturopath will ask how much dairy food is in your child’s diet as an allergy may be affecting the sinuses. A diet high in citrus fruits and home-made juices may be pre­scribed. Epsom salts may help to detoxify and herbal medi­cine such as Echinacea, Golden Rod, Golden Seal and Marshmallow Leaf may be given. Supplements of mineral salts and vitamins A, B and C may be prescribed. Alternate hot and cold compresses can help to ease congestion and pres­sure in the sinuses. A reflexologist will work on the parts of the foot relating to the head as well as the adrenal gland reflex area. All of the toes will be worked on which covers the sinus cavities as well as some sensory organs, the brain, mouth and nose. Working on the areas relating to the adrenal glands will help simulate the ‘fight or flight’ response to help fight off infection. One study found that acupuncture was success­ful in reducing the intensity of sinus pain in half of cases. The type of treatment will depend on whether the condition is acute or chronic. In acute cases, treatment would try to reduce the heat in the body caused by a build-up of mucus and phlegm which lead to congestion and inflammation in the sinuses. In more chronic cases, the child will be more weakened and suffer frontal headaches, exacerbated by changes in temperature and so these symptoms would be treated. If symptoms last for more than a couple of days consult your doctor. Other therapies that may be beneficial: homoeopathy, bio-chemic tissue salts, osteopathy.